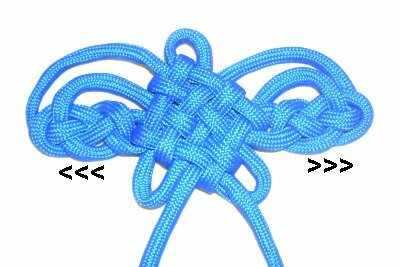 Description: The Chinese Butterfly is a combination knot made with both the Mystic Knot (Pan Chang) and a Josephine knot (Double Coin). 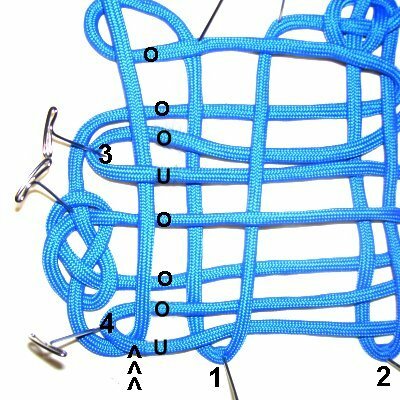 You must know how to tie both knots easily, or this Macrame pattern will be difficult for you to complete. 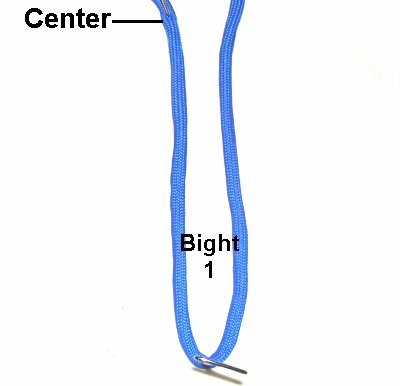 This Chinese knot can be used as a pendant, since the loop at the top could be an attachment point for a necklace cord. You can also use it as a decoration for handbags, belts, plant hangers and more. 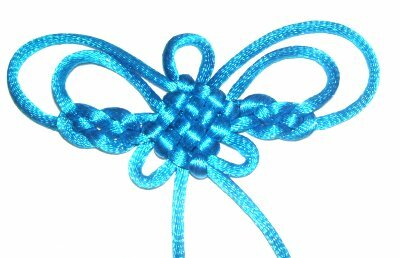 This Butterfly shaped knot looks great when made with Satin cord material, as in the image above. When tightened firmly, it will result in a wingspan of approximately 3 inches. 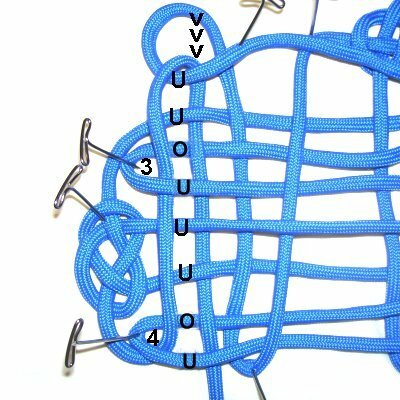 I used Paracord in the images below to make these instructions easier to see. This design looks best when made with 2mm cord material, but you can use other sizes, too. 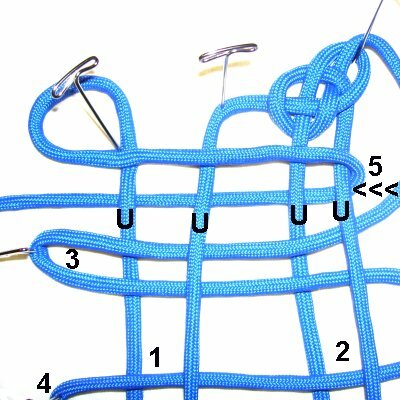 Important: Please be sure to lean the pins or use the cross-pin technique to secure the loops and bights, if using Satin, Leather or Silk. Preparation: Cut one cord, at least 2.5 yards long. When making the Chinese Butterfly, you will create a series of bights in vertical and horizontal directions. Try to make these bights around 3 inches long, so you have room to work. That's why you need so much material; this way you can make the design large the first time you try it. 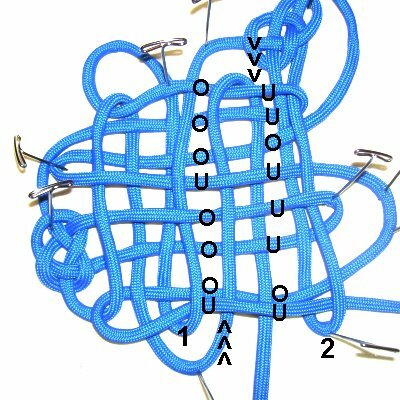 For the first 3 steps of the design, you will be using the right half of the cord. Secure the left half for now. Step 1: Secure the center of the cord on your left, at the top of your board. Form bight 1 with the right half of the cord. It should be long and narrow. Place a pin at the upper right, directly across from the center (see next image). This is to mark the area for step 2. 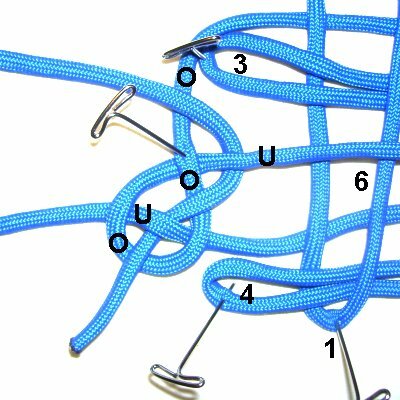 To make the first Josephine Knot for the right wing of the Chinese Butterfly, make a counter-clockwise loop with the right end. As you bring the end down to the right of bight 1, pass under to make the crossing point for the loop. Bring the right end down, fold it to form bight 2, and then move it up to the top again. Pass it under loop 1. 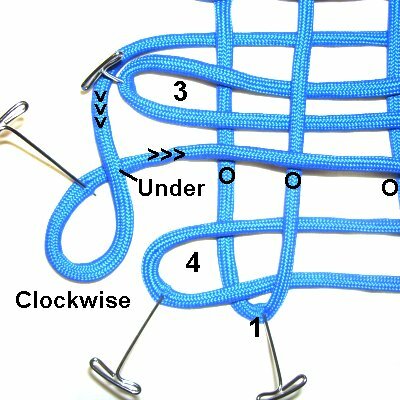 Step 2: Begin the second loop for the Josephine Knot by moving the right end over the segment you marked with the pin, to the left of loop 1. 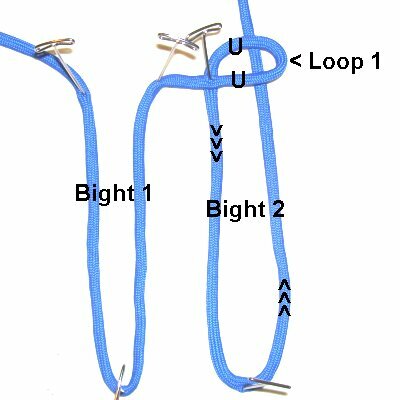 Pass it under the left side of bight 2, and then through the loop, over - under - over the three segments. 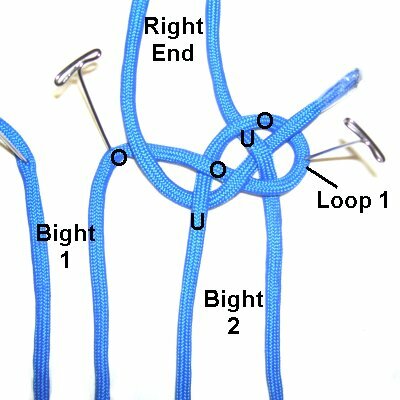 Tighten the Josephine Knot slightly and balance the loops. Step 3: Create bight 3 by weaving the right end through bights 1 and 2, under - over - under - over. Weave right to left, fold the cord, and then bring it back to the right. The path is the same both directions. Create bight 4 by repeating the previous step. Place the bight as close to the bottom as possible, near the folded areas of bights 1 and 2. The area between bights 3 and 4 should be wide as shown in the image. The area above bight 3 should be fairly wide, too. Secure the right end, since you will not be using it again. 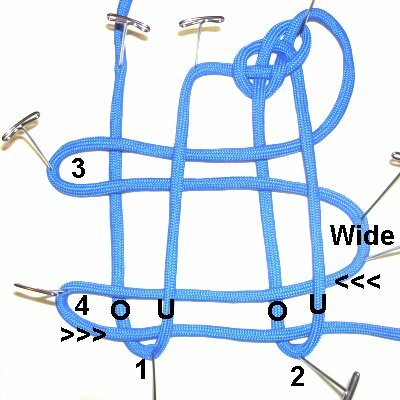 You will use the left end to complete the remaining bights and weaving for the Chinese Butterfly. 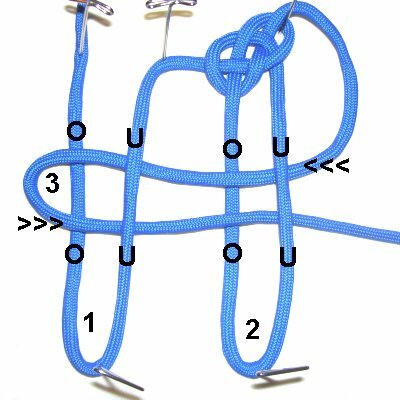 Step 4 takes place above bight 3 and below the Josephine knot on the upper right. Step 4: Make a counter-clockwise loop with the left end, so it rests at the upper left area of the Chinese Butterfly. Move the end towards the right horizontally, passing over all of the vertical segments (bights 1 and 2). Fold the left end around the right side of bight 2, to make bight 5. Bring it back to the left, passing under the vertical segments. Important: Make sure you do not fold it around the segment furthest to the right. Pass the cord around bights 1 and 2 only. Step 5: Bring the left end down to the wide area between bights 3 and 4. Make a clockwise loop, passing the end under to form the crossing point. 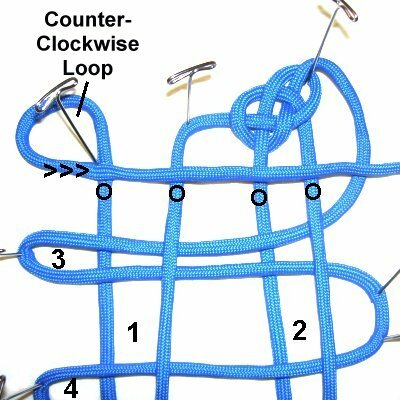 This is loop 1 for the left Josephine knot. Bring the end to the right, passing over the 4 vertical segments of bights 1 and 2. 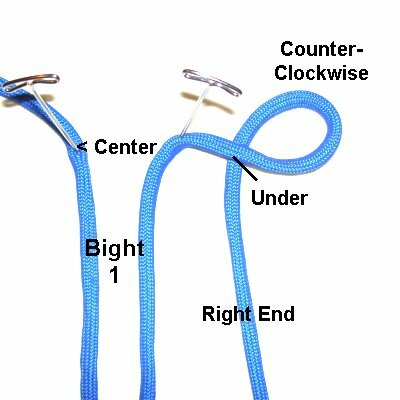 Fold the cord around the right side of bight 2 to form the bight 6. This is the same as step 4 (bight 5). Bring it under all the vertical segments, moving right to left. Pass it under the new loop. Rotate the left end in a counter-clockwise direction. Pass it over the segment close to bight 3. Pass it under the segment of bight 6, near the crossing point of the first loop. Weave it over - under - over the loop. 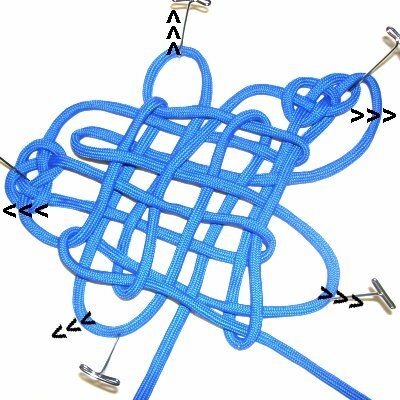 Tighten and balance the Josephine knot before moving on to the next step. Important: Before moving on to step 6, make the 6 bights as narrow as possible. Spread things out so you can see all areas of the Chinese Butterfly. The vertical weaving for step 6 takes place to the left of bight 1, close to the folded areas of bights 3 and 4. 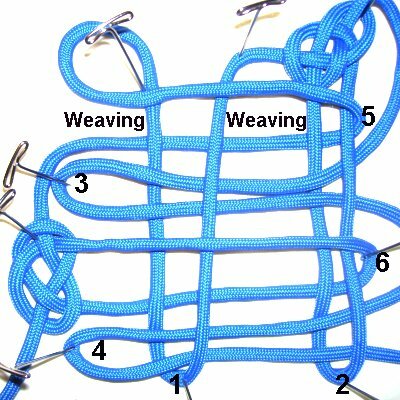 In step 7, the second area of weaving takes place between bights 1 and 2. 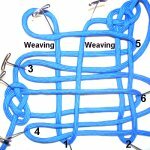 The focus of the weaving for the Chinese Butterfly will be bights 3 and 4. You will pass the end through them. These cords have yellow and black symbols in the images below. Step 6: Bring the end through bight 4 heading towards the top, which is under - over. Pass it over the next two segments. Move it through bight 3, under - over. Pass it over the next two segments, ending at the lower part of the loop on the upper left. Bring the end back to the bottom, passing under two segments, and then over - under bight 3. Pass under the next two segments, and over - under bight 4 at the bottom. Step 7: Move the end around bight 1 at the bottom, and to the space between it and bight 2. Repeat step 6, weaving the cord vertically towards the top, and then down again. The over - under pattern is exactly the same. The loop on the upper left is the "head" of the Chinese Butterfly. The wings are the areas with the Josephine knot. The areas marked with an X are the loops at the bottom. Keep these 5 areas secured until the design is completely tightened. Pull on the five areas, after turning the design so the loop for the head is at the top. The center of the Mystic knot will begin to tighten. Reduce the size of each area, moving the pins as needed. 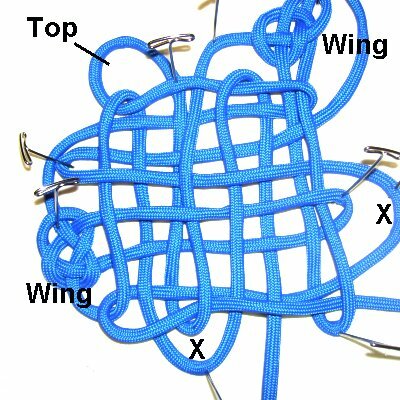 The Josephine knots for the wings need to be horizontal as you tighten the Chinese Butterfly. 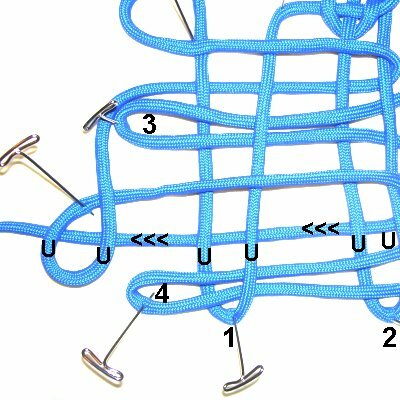 Make the areas between the head and the Josephine knots wider, forming the curved details at the top of the wings. The head and lower wings can be any size. To finish the design, you can move the ends to the back and slide them under a portion of the Mystic knot. You could also let the ends dangle, adding beads and/or finishing knots. Have any comments about the Chinese Butterfly? Contact Me.